Review posted August 3, 2017. Scholastic, 2017. First published in the United Kingdom in 2016. 53 pages. Martin Brown is the illustrator of the Horrible Histories books that my son loved when he was younger. And this book has the same wit and wisecracks. Fed up with the same old animals? Had enough of hippos? Bored with bears? Tired of tigers? Do you want animals that are fresh, new, and exciting? 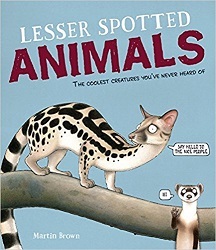 Try Lesser Spotted Animals, a book about the wonderfully wow wildlife we never get to see. There are thousands of different animals in the world – big and small, common and rare – but most books show you just a slender selection of those thousands. And it’s the same slender selection over and over again. It’s time for a book that’s different – without the same ho-hum, run-of-the-mill creatures we’re served day in, day out. No pandas, elephants, or zebras here – this is a book about the world’s other animals. Everyone’s heard of the koala – so cute and gray and fluffy – a nature superstar. And if it ever became extinct we would cry and weep and wail. But what about the pika? Hmm? It’s cute and gray and fluffy, too. Would we cry and weep and wail if it vanished forever? How could we? No one’s ever heard of it. Why? Because all the books are full of koalas – and lions and tigers and all the other usual, regular celebrity creatures we always see…. Discover all the amazing beasts you never knew you needed to know about, because it’s good-bye to the gnu and cheerio to the cheetah, say hi to the hirola and nice to meet you to the numbat . . .
After that, there are descriptions of twenty-three animals you probably never heard of, including a box with information about their size, what they eat, where they live, and their endangered status, plus some bonus facts. However, the really important thing about crabeater seals is that they are probably the most numerous large animal you’ve never heard of. There are something like 200,000 brown bears in the world, 600,000 bottle-nosed dolphins, and roughly 700,000 common zebras. But sitting on the ice and swimming in the cold southern sea there’s somewhere between ten and fifteen million crabeater seals. So why don’t we know about them? Because bears go RAAAH and zebras look dashing and dolphins do backflips. The poor crabeater is a dull, pale browny-gray color. It can’t jump and it doesn’t chase its prey in thrilling, TV-friendly fashion. It doesn’t even eat crabs! But there are, by far, more crabeater seals on Earth than any other large wild mammal. SO THERE. You get the idea! If you have children who enjoy knowing obscure facts, this book is sure to win them over. Learn about such creatures as the Cuban Solenodon, the Zorilla, Speke’s Pectinator (“Little Gray Ratty Thing Is: THE PECTINATOR”), the Gaur, and the Onager. Lots of fun, and informative, too.